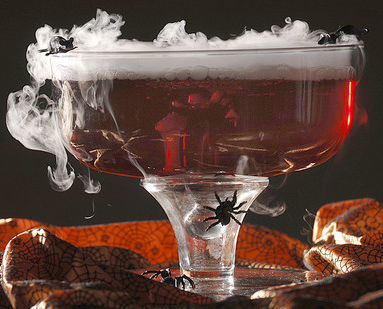 I brought you a cauldron full of Halloween cocktails, which you can check out here, so today I am bringing you Halloween Punch recipes. 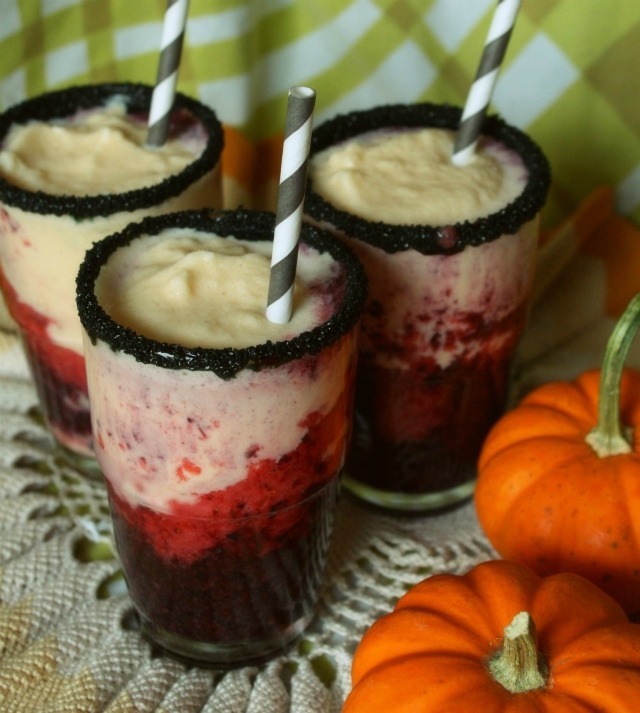 These include both spiked and non-alcoholic versions of a variety of Halloween favorites. Mix Champagne and orange juice in large punch bowl, scoop sherbet into bowl until it has produced a nice film over the top. Float peeled grapes in mixture, and garnish bowl with the rest of the grapes. Drop in pieces of dry ice for effect (do not eat dry ice). If you want to raise or lower the alcohol content in the punch, add vodka or clear soda. Mix orange juice and pineapple juice in a 1/2 gallon pitcher. Chill. 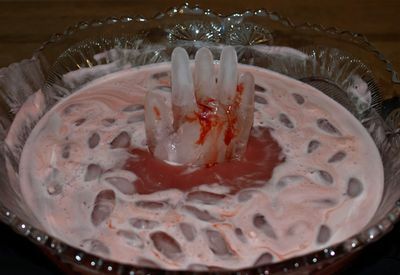 When ready to serve, use clear glasses to see the “dripping blood” effect. Put ice cubes in glasses, then fill glasses 2/3rds full with juice. Add enough ginger ale to fill glasses. Garnish each glass will a round of cucumber. 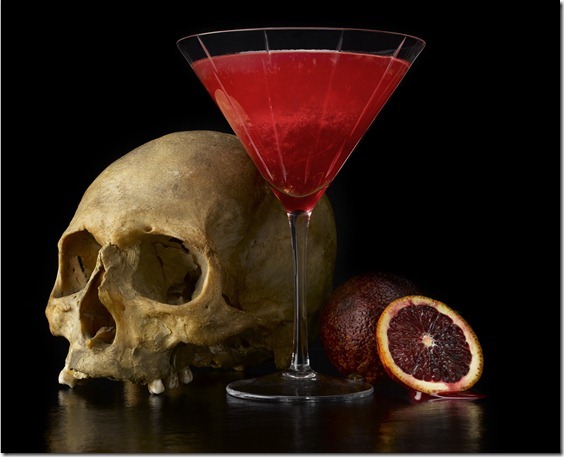 Use a small spoon to slowly drizzle 1 teaspoon of cranberry juice concentrate around the inside rim of each glass and watch the red “blood” drip down the inside of the glass. Arrange the gummy worms in a 12-compartment ice tray, letting them hang out over the edges of the tray. Fill with root beer and freeze at least 4 hours or overnight. With a small ice cream scoop, fill the bottom of a one gallon punch bowl with scoops of both frozen yogurts, using the full container of each. Very slowly fill the punch bowl with root beer; it will foam up. Float the wormy ice cubes in the top of the punch. Fill each punch cup with a scoop of ice cream and an ice cube. Float additional worms on top of the punch or in each glass. Make the fruit punch according to the directions on the can and place in the punchbowl. Add the ginger ale and stir well. 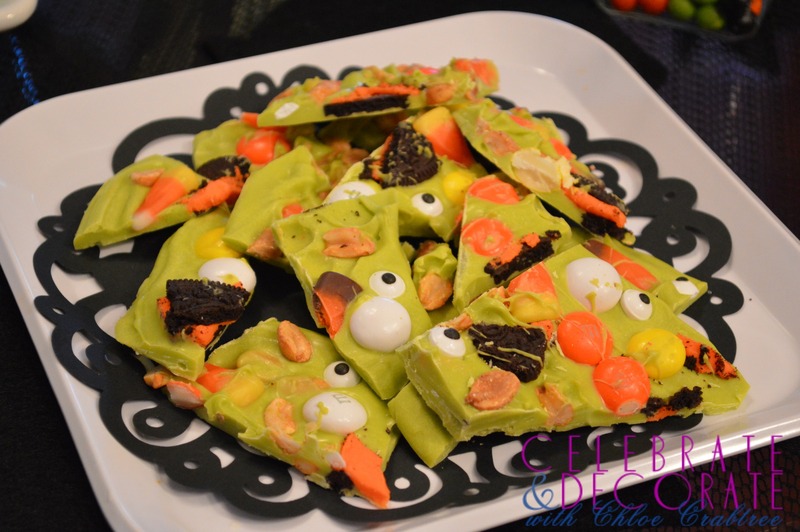 Add sherbet and a few drops of food coloring just before serving. Combine all the ingredients, except the licorice, in a pitcher. Stir to mix. 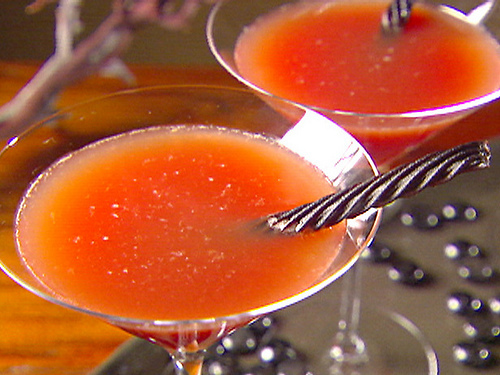 Pour into glasses and garnish with a stalk of licorice. 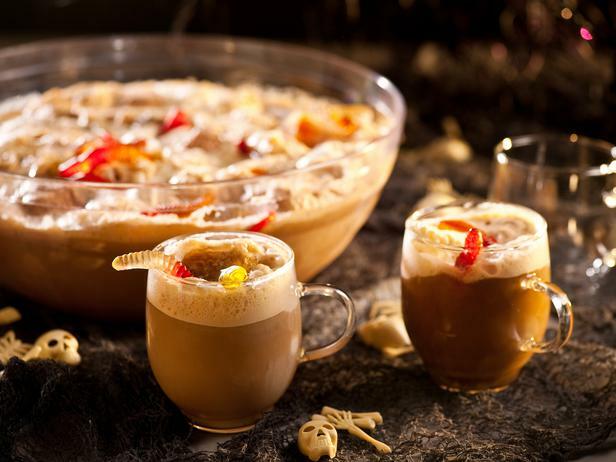 To serve a larger group, increase the recipe as needed and serve from a punch bowl. 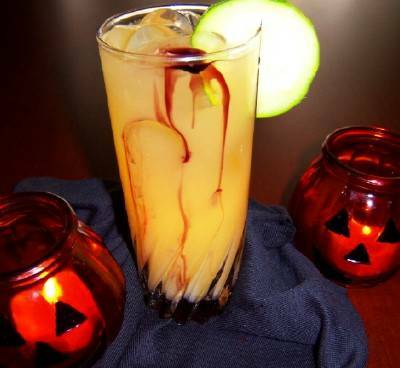 Don’t miss the Halloween Cocktail recipes for the grown-ups at Halloween Cocktails!